I recently stocked up on some washi tape from my trip to Japan and have been researching some cool DIY washi tape ideas! 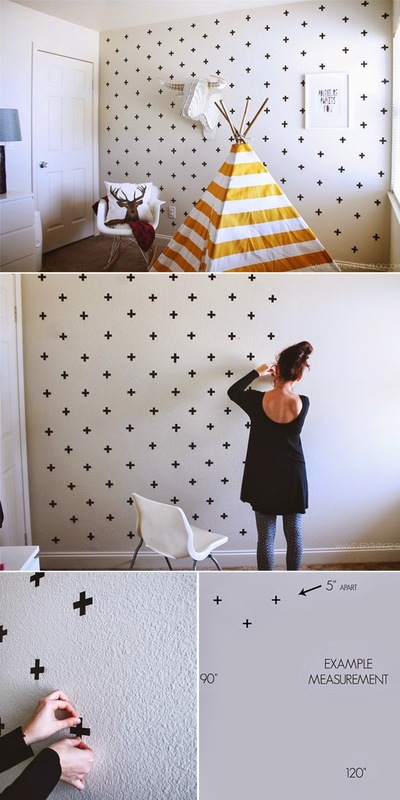 I came across this super cute wall decal via Everything Emily. I love that she only used 2 rolls of washi tape but for those that don't have any, black duct tape or electric tape would do. I've DIYed a few wall decals with duct tape and it's worked a treat! It's stayed on for over 6 months now, no sweat! Just cut 2" strips, and stick them on the wall at 5" apart. You can also heat them with a hairdryer for that extra durability. All of this for under $10! Make sure you check out her full tutorial here. This is awesome! So cheap and a great idea... great job!